Director Hiroshi Shimomura D.D.S., D.D.Sc. Our clinic is dedicated to serving you in a comfortable atmosphere using modern equipment. The treatment room is extremely spacious with large windows and soothing background music. We will not start without informed consent and agreement. Our goal is to provide the best dentistry available. An advance appointment is recommended. You are welcome to use Japanese Health Insurance, if you do not have this, please contact us. We can treat dental emergencies, give routine check-ups, do cleaning, fillings, root canal treatment, crown & bridges and esthetic restorations including　tooth　whitening. Hare you ever heard prerention of periodofal disease? has a effect tp polish your teeth by making them smooth too. The progress of periodontal disease is very difficult to notice , and it is the major cause of losing teeth. 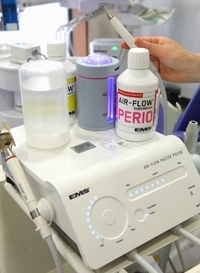 The initial treatment for periodontal disease is cleaning, in some cases, surgical treatment by Laser will be applied. instead of using the power tools (Turbines) . The cavity is restored by the use of composite resin, metal or ceramics. Whitening will be effectively done in a short time by using a whitening machine. Tooth whitening is a very safe way to get back brighter teeth again. Home whitening system also available. 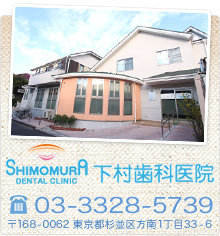 Copyright 2010 SHIMOMURA DENTAL CLINIC All rights reserved.